quite possibly the best blog you will ever stumble upon. : Here's hoping books don't become extinct! It would be a shame for us to completely cease the production of books and paper; If we did so, what shameful fate would befall on the beautiful bookshelves and storage units of the world? Yes, books use paper, and paper comes from trees, and trees make oxygen and clean the air. But we can make books using only recycled paper, or even out of bamboo, can't we? Anyway, I digress yet again. I really like this cool Hive H2Shelving System by the self-taught artist and desiger, Chris Ferebee of 521 Design. 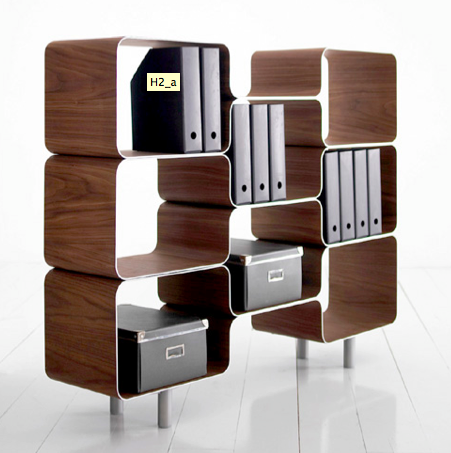 It's made of bent aluminum with walnut face veneers. Totally beautiful! Each module can be bought separately and configured however one sees it fit. And they are made in Denmark.